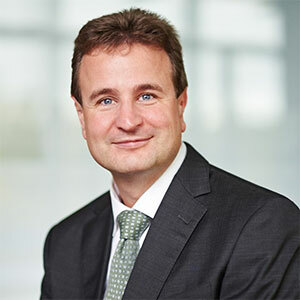 Dr. Daniel Witthaut is Head of Corporate Innovation Strategy at Evonik Industries AG, a global leader in specialty chemicals. He completed a brilliant presentation at R&D Innovation Strategies & Process Excellence Summit last November in Berlin. He kindly accepted to answer a few questions about some of the innovation approaches he’s developing at Evonik. 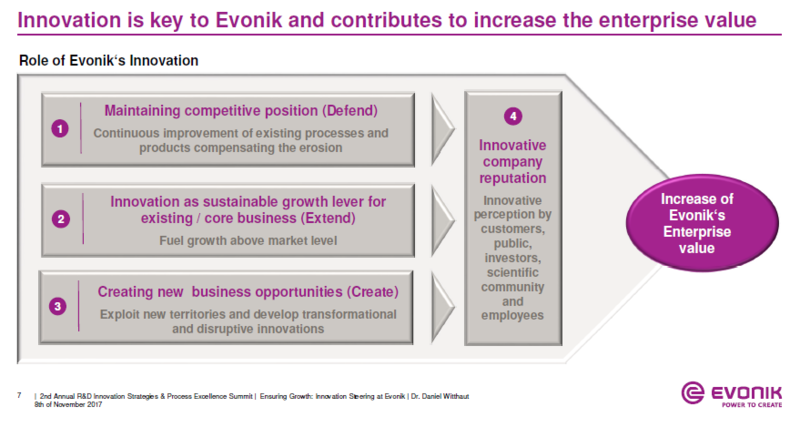 1) Hi Daniel, would you explain what is the main businesses of Evonik, and why innovation is key in the development of your company? Evonik is one of the world´s leading specialty chemical companies. 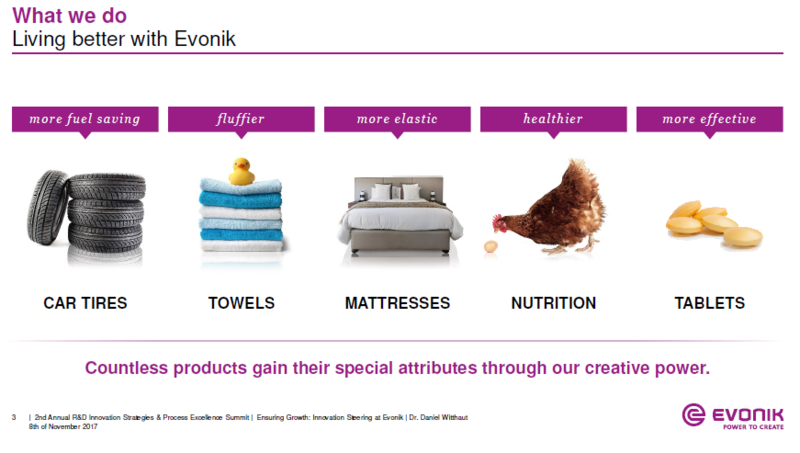 Evonik supports very different market with e.g. with additives for the oil and coatings industry, with materials to raise performances and with products for nutrition and care businesses. The focus on more specialty businesses, customer-orientated innovative processes, and a trustful and performance-oriented corporate culture form the heart of Evonik’s corporate strategy. We believe that they are the lever for profitable growth and a sustained increase in the value of the company. Last year more than 36,000 employees generated sales of 14.4. Bil. Euro and an adjusted EBITDA of about 2.4 Bil. Euro. Innovation is an important margin and growth driver, and will continue to play a key role in our growth strategy. New products, solutions and business models will make a significant contribution to the growth and profitability of Evonik. 2) How does corporate innovation team support the innovation endeavor? Corporate Innovation is the spearhead of strategic innovation at Evonik, and takes on the role of guiding and setting the direction for innovation at Evonik. We maintain a close partnership with our segments to generate new businesses and to position Evonik as one of the world’s most innovative companies. Corporate Innovation is a highly specialized, interdisciplinary team with approx. 330 employees. Researchers, experts, managers, breakthrough minds, talented individuals and visionaries work here together in a team to foster the image of Evonik as an innovative company. Focal points of the Corporate Innovation unit are Creavis, Innovation Networks & Innovation Marketing, Strategy & Innovation Excellence, and Venture Capital. Strategy & Innovation Excellence proposes innovation targets and the innovation portfolio, identifies innovation potential and, from this, develops the innovation strategy and focal topics for the Group. E.g. in 2016 we took an important step to pave the way for the future: We restructured our innovation portfolio and now focus on six innovation growth fields with above-average growth rates, and a perfect fit within the company’s growth strategy. The aim is to generate more than € 1 billion in additional sales in these areas by 2025. 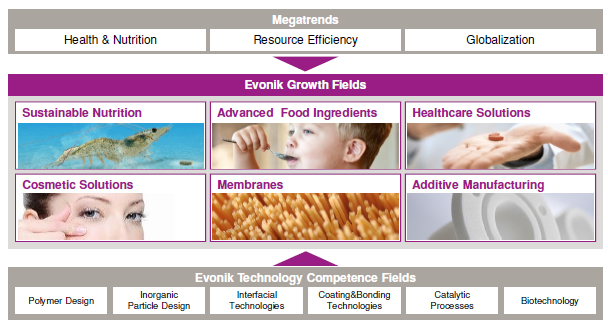 The six growth fields focus on highly attractive markets which Evonik can optimally serve with new products and solutions based on its core competencies. The innovation growth fields are sustainable nutrition, healthcare solutions, advanced food ingredients, membranes, cosmetic solutions, and additive manufacturing. Evonik Venture Capital GmbH, the venture capital group of Evonik Industries AG invests in highly promising start-ups with break-through technologies and leading venture capital funds. 3) You’ve framed a specific business case approach for innovation, sorting out growth innovations from defensive innovations. 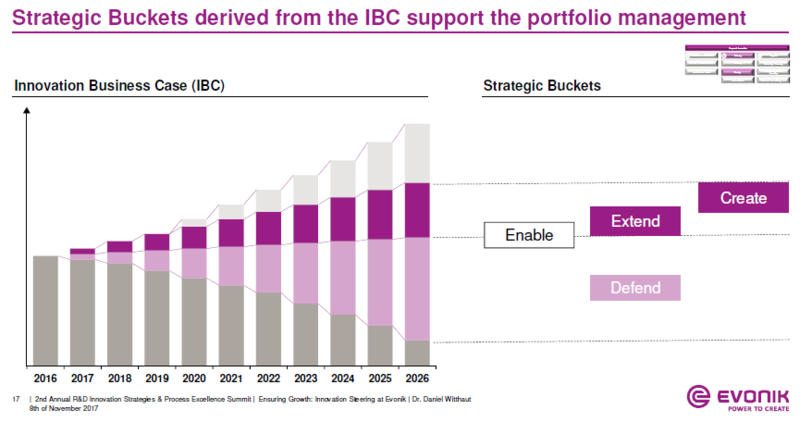 Could explain how this innovation portfolio works? We have given us Innovation specific growth targets and the Innovation Business Case is our tool of choice to monitor our progress towards target achievement. It is often neglected that a great contribution of Innovation is the defense of the competitive position that allows us to keep our market share and grow with the market. This type of Innovation is called “Defend” type Innovation at Evonik. Without this type of Innovation the business would erode over time and loose its market share. This erosion rate over time needs to be estimated – e.g. based on product life cycles and industry cost curves – in order to ensure that sufficient “Defend” type projects are in the pipeline to compensate for the expected erosion. In addition to this defensive function, Innovation serves as a lever for additional growth on top of the respective market growth. There we differentiate between “Extend” type of Innovation which are Innovation Projects that are adjacent to our current market and technologies, and “Create” type Innovation which are Innovations that will result in new products for new markets. From a strategic perspective both –“Extend” and “Create” will support additional growth but these type of Innovation have a different risk profile and need to be managed and evaluated differently. Secondly it also helps to steer Innovation in accordance to the respective strategic role, therefore a growth business is expected to allocate resource in the strategic buckets of “Create” and “Extend” type of Innovation (while ensuring sufficient resources are applied at “Defend” to counter the erosion rate) whereas financing business should focus their resources mainly on “Defend” type of Innovation. Applying this concept we can ensure that the resources for Innovation are sufficient and applied in accordance to the strategic role of the business. 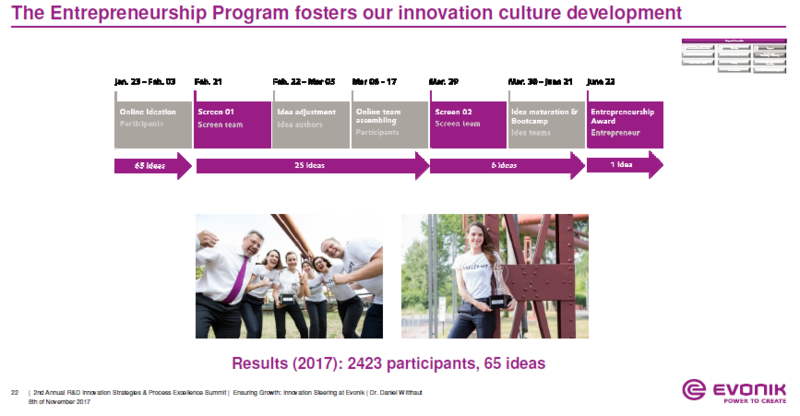 4) Intrapreneurship is live at Evonik: what are the key steps of the program, and what kind of budget / support do intrapreneurs receive? Have you an example of intrapreneurial project under development? What is the profile of the winner of the contest? Corporate entrepreneurship is an important milestone in our culture of open innovation. We are intentionally promoting a culture where employees have the courage to try something, new and are not afraid to make mistakes. This year was the second time that the award was presented, and it is now a permanent feature of Evonik’s innovation strategy. It promotes the implementation of unconventional ideas, and strengthens the innovation culture as well as collaboration across departmental and country boundaries. The six teams that presented their ideas during the final had been chosen during the course of the idea competition, the so called Ideation Jam. In total, 65 ideas had been submitted on the company’s strategic relevant topics of nutrition, living, and mobility of the future. 2,000 members followed the Jam in an internal community. After four months of brainstorming, the participants were sent by Corporate Innovation to boot camp, an intensive three-day-long workshop where they received specialist training from experts and developed business models and created business plans. Each idea team benefited from the experienced coaches from the Group who accompanied the process the entire time and motivated the teams and showed them the right path. Dr. Sarah Hintermayer, who studied bioprocess engineering at the TU Munich and works at Evonik Technology & Infrastructure, won the 2017 Evonik Entrepreneurship Award for her new business idea called “WallCraft”. The idea behind “WallCraft” is about an additive that extends the longevity of concrete by combining hydrophobing agents and self-healing. She now has the opportunity to spend one year as an entrepreneur within the company developing her business idea and bringing it into a business model. 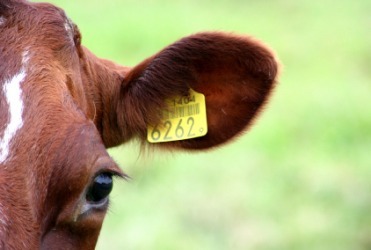 For this she will receive a budget of €200,000 from Evonik. 5) What would you like to improve in the intrapreneurship program? We do believe in Intrapreneurship! A person who is motivated, and willing to develop his idea further. But we also believe, that just a single person is not enough to fulfill every role which is necessary on the way from the first idea to the market. So during the process the potential Intrapreneur has to build up a team around him, which supports him through the whole process. But in the end, on the day of the Entrepreneurship Award, there is just one person winning the “year off”, not the full team. In the future we would like to give at least one more person out of the team the chance to further work on the idea. This leads to another challenge we face: getting the people out of their daily business and give them as much freedom as possible. This is not just an HR topic, but also a cultural topic. Try to imagine that you are the previous supervisor of the Intrapreneur. If your employee wins the competition, you will “lose” him for at least one year. Not every supervisor would be pleased thinking about this situation. The third challenge I want to mention is the implementation of the ideas after one year into the operative segments. During the Ideation Jam we are searching for new, and most important, radical ideas. But after one year of development they somehow have to fit to the operative segments and their strategy. To summarize it, we have to make sure to find a “new home” for both: the ideas AND the Intrapreneur. 6) More broadly, what are the next challenges for your innovation team? The Innovation way is changing and we need to be a driver for that change. Significant additional growth through Innovation is mainly achieved through transformational Innovation or what we call “Create” Innovation. This type of projects face a high uncertainty – not only from the market and technology but also in the area of resources and organization. We are currently in the process of upgrading our Innovation Management style for this type of “Create” projects, ensuring that depending on the phase of the project –e.g. be it in the Discovery, Incubation or Acceleration stage- these uncertainties need to be addressed at the right level of insight. But it is not only a different management style to be successful at “Create” Innovation. We also need to ensure that we have the right partners for our Innovation – be it an agile start-up or a big conglomerate that is even bigger than Evonik. Here we already have several levers like the above mentioned Corporate Venturing or our Cross Industry Team that support to find the right partners. With the dynamic developments in technologies including digitalization, it will be important to work together with the right partners and create and manage the respective Innovation Ecosystems for the mutual benefit of the partners and Evonik. Previous Design Sprint, 5 days for an innovation journey: is it speed or haste?